Garage door openers are notorious for being noisy. If you have an older garage door or garage door opener, or you have a garage door with worn down parts, there is a good chance that it makes quite a bit of noise when opening or closing. Having a noisy garage can be a huge disturbance to others in your household and even your neighbors. In fact, we express our sympathies to anyone who has a bedroom right about a noisy garage door opener — that noise is not something you prefer to wake up to! Whether you have an old garage door opener or a new one, at some point in its lifetime it is likely to cause some ruckus. This could be caused by worn parts or many other difficulties. However, there are multiple approaches you can take to help silence these loud and disturbing noises and avoid distracting those who are nearby. If you find that your garage is grinding, clunking, squeaking, or making another bothersome noise, check out some tips that may help your garage door opener become quieter and less of a disturbance. There are multiple types of garage door openers. The most common types of garages door openers you will see in homes are belt-driven, chain-driven, screw-driven, direct drive, and jackshaft garage door openers. Jackshaft and direct drive garage door openers are generally quieter than other openers, however, belt-driven openers are the most common type of garage door openers and are still far quieter than chain or screw-driven garage door openers. Although there are plenty of benefits that come with having a screw or chain-driven opener if noise is something you are concerned about you may want to avoid these types of openers. Choosing the right opener is an essential step to controlling and reducing the noise your garage door opener makes. The grinding, rattling, and creaking that comes from a garage door opener can really be a disturbance to family members, especially if someone in the household works early or late hours. However, sometimes a garage door opener is not always the sole culprit of the noise you hear. If you are trying to achieve a garage door and opener that is quiet, there is some maintenance that can be done to help reduce the noise. There are simple steps that can be taken and there is some garage door maintenance and repair that can be done by a garage door company to help reduce the noise your opener makes. Check some of them out! Torsion springs are the springs that are found just over a closed garage door. These springs are tightly wound, making them extremely dangerous, and should only be serviced and disassembled by a trained and experienced garage door technician. In addition to the torsion springs, there are also extension springs that can be located on either side of the garage door about the upper tracks. These springs are known to be loud and can make a squeaking or clanging noise that is annoyingly noticeable. Any easy way to make these springs quieter is by applying oil or a type of lubricant to them. Or, schedule a time for a garage door technician to come out and inspect the situation and solve the problem. Vibration is one of the main causes of a noisy garage door. Since most garage door openers experience consistent use, the vibrations from daily use can shake and loosen the nuts and bolts overtime. Sometimes, these loose pieces are the reasoning behind all of the commotion. By grabbing a wrench and carefully going through all of the bolts and nuts and retightening them is a great way to cut down or entirely stop the noise. The metal hinges on your garage door can be a factor of garage door noise. When these hinges become dull and worn, they are known to constantly grind and squeak. As time passes, the rollers inside the hinges will age along with your garage door and can become quite noisy. The best approach is to inspect the roller stems within the metal hinges and search for signs of wear and check for any loose parts. The rollers inside should be able to move when pushed with a finger if they are stuck or have difficulty moving side to side try adding lubricant. That should help reduce the noise emitted from the hinges and roller stems. If noise is still an issue, you may want to consider garage door roller replacement. Garage door rollers are made from either nylon or metal. When these rollers become worn, they are well-known for causing a lot of noise, usually a terrible squeaking sound. You can help reduce the noise by adding some lubricant, but if the rollers are worn they should be replaced. Garage door rollers can be difficult and dangerous to repair by yourself. You should have roller replacement performed by a professional garage door company. Garage Door Doctor Power Tip: Nylon rollers are generally quieter than metal, so if you want a quieter garage and are replacing the garage door rollers, be sure to choose nylon. Sometimes the noise isn’t coming from the rollers, hinges, or springs. Occasionally, the noise is coming from the garage door opener itself. 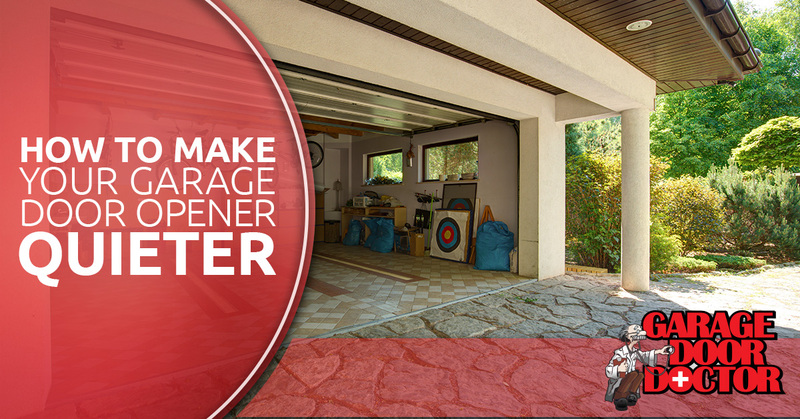 If you have a chain or belt driven garage door opener, a loose garage door could be the cause of the noise. Be sure to check the manual to verify how much tension is allowed from your trolley mechanism. Lubricant can be added to a chain and screw-driven openers to help the metal components slide together without creating a lot of noise. Garage Door Doctor Power Tip: NEVER use lubricant on belt-driven openers! When your garage door opener is making a lot of noise and is a household disturbance, you’ll likely want to try fixing the problems yourself. While the tips above can be beneficial is solving your noise issue, there is also the risk of the dangers of DIY garage door repair and maintenance. By trying to fix the problem yourself you are risking making the problem worse, causing damages, or getting injured. 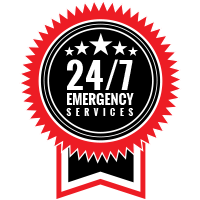 When you need opener repair and maintenance done, you should contact a professional garage door company to arrive on site and inspect your garage door, garage door opener, and all of the components involved to get the root of the problem. Professional garage door technicians have the required knowledge, experience, and tools to perform garage door maintenance and repair. 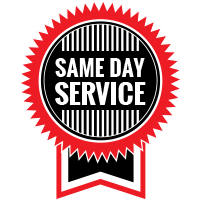 In need of garage door opener repair in Indianapolis? If your garage is making noise, or if you are in need of garage door opener or garage door repair in Indianapolis, contact Garage Door Doctor! Our team of garage door technicians specialize in garage door installations, garage door repairs, and garage door opener replacement. Whether you are in Indianapolis, or in the surround areas, we can help you with your garage door and opener needs! To receive a free garage door estimate, contact us!